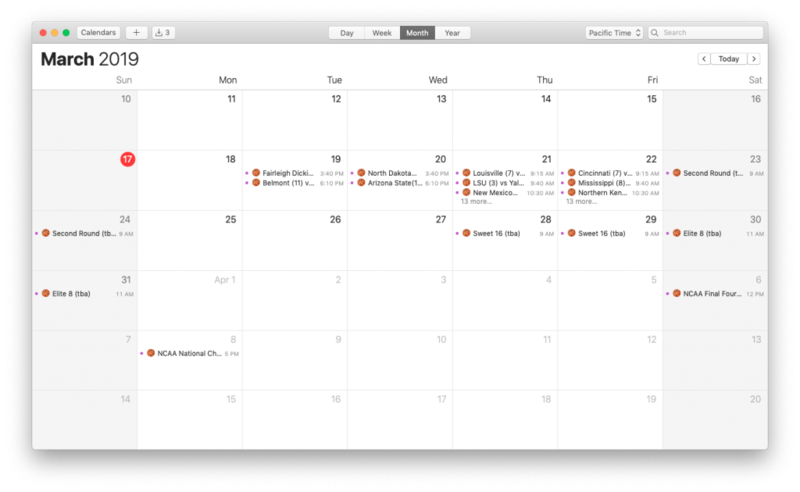 Here is the NCAA Men’s Basketball Tournament calendar, in ics (iCal) form. It’s as up-to-the-minute as I can make it and I’ll keep updating it as games are played. 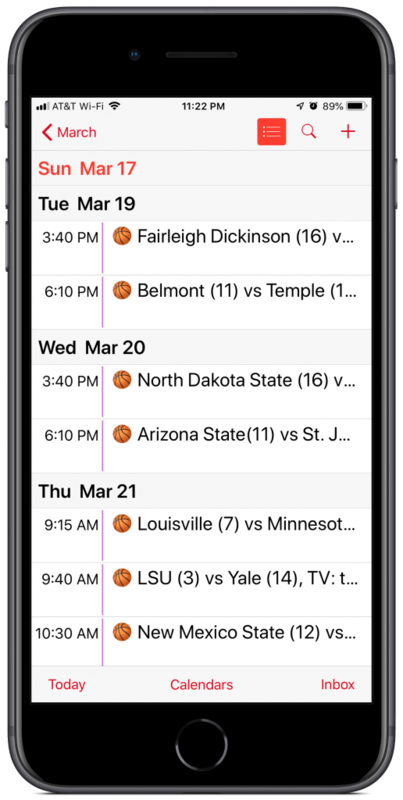 Game times are correct for your time zone– none of that “All Times Eastern” stuff. Bonus: if you subscribe to my calendar this year, and assuming I get some good feedback on it this year, I’ll do it again next year and you won’t have to do a thing. 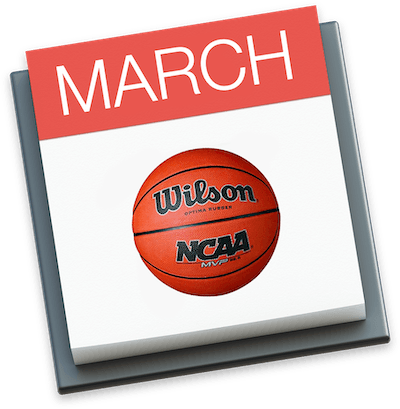 The games will magically appear in your calendar next March. You’ll probably want to set things up similarly on your Mac. The important part is you want the calendar to refresh every day (or more frequently than that if you want). It also works with Google Calendar. Just right-click this link and copy it, go to Google Calendar (that is, use a web browser to go to calendar.google.com), and click the stack of three dots to the right of “Add calendar.” Choose the option to “Add from URL.” Paste in what you copied and you’re all set. 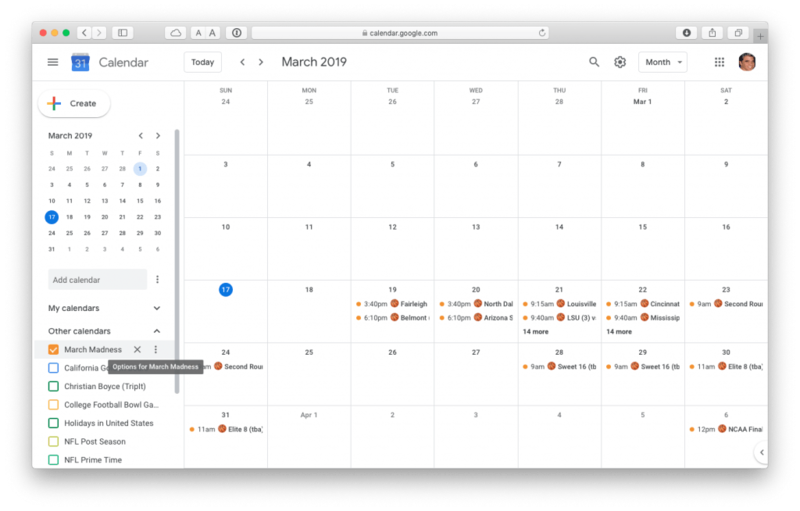 (Once added via a web browser you should see the calendar (in a few minutes) as an option in your Google Calendar mobile app. In that app, go to Settings (the three horizontal lines at top left), then “Show more” (below “Events” and “Reminders”). Check the box for March Madness and you’re all set.) The URL you paste in should start with “webcal://.” If the URL starts with “webcal:%2f%2f” your browser has converted the URL using “URL Encoding.” In my experience, Chrome sometimes applies URL Encoding to URLs and Safari never does. The URL has to have slashes in it. If it doesn’t, change every instance of “%2f” to “/” and you’ll be all set. There are five slashes in the URL, starting with the two in a row after “webcal:”. 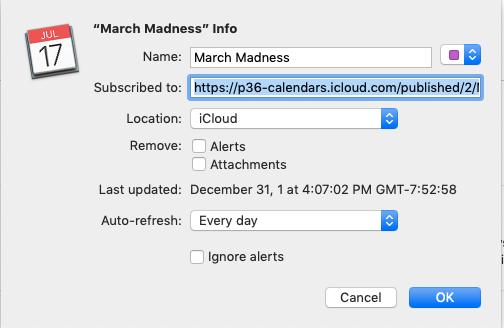 Google is very, very slow to update iCal-type calendars, so you may not see the calendar updating as I modify it to show the results and who’s advancing. The only practical solution for you is to delete the calendar and add it again. Even then, you may get a cached version of it, not an updated one. Bad. The official March Madness app (for iPhone and iPad) has a lot of great features (best one: you can watch the games on your iPhone) but it doesn’t integrate with the Calendar app on your iPhone, Mac, or iPad. That’s where my calendar comes in: it shows up in the Calendar app. I couldn’t find such a calendar online so I made it myself. I make a similar calendar for the College Football Bowl Games every year. Subscribe to that one and get the schedules, year after year. I do listen to feedback (in fact, that’s why I’m doing the March Madness calendar), so please let me know (via the comments) if you have a suggestion or correction. I’d really appreciate it. Thanks for that, Matt! I appreciate the comments. Tell a friend! Every “share” helps. Big day today: 16 games to monitor and update.